2010, Di Marco M. et al. 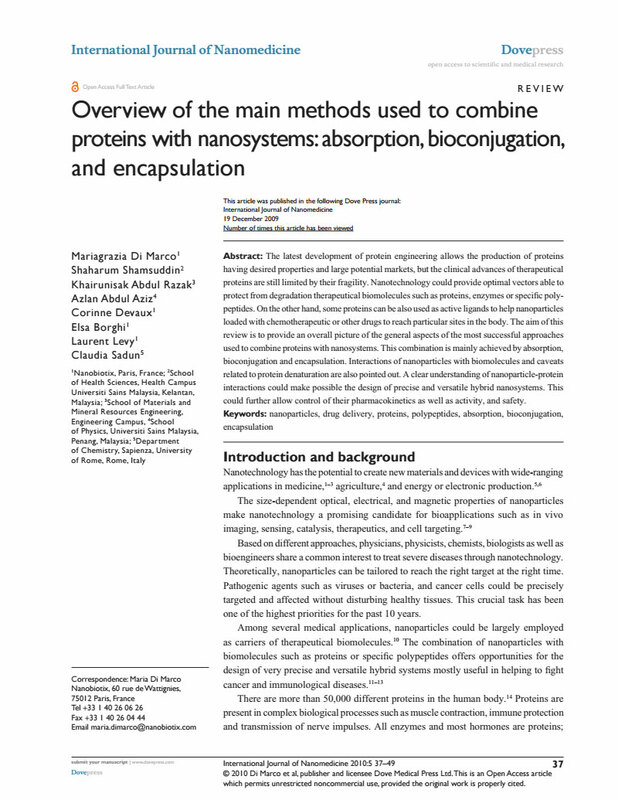 Nano Publications > Publications > Miscellaneous > 2010 – Combinations of proteins with Nano-Systems – Di Marco et al. Abstract: The latest development of protein engineering allows the production of proteins having desired properties and large potential markets, but the clinical advances of therapeutical proteins are still limited by their fragility. Nanotechnology could provide optimal vectors able to protect from degradation therapeutical biomolecules such as proteins, enzymes or specific polypeptides. On the other hand, some proteins can be also used as active ligands to help nanoparticles loaded with chemotherapeutic or other drugs to reach particular sites in the body. The aim of this review is to provide an overall picture of the general aspects of the most successful approaches used to combine proteins with nanosystems. This combination is mainly achieved by absorption, bioconjugation and encapsulation. Interactions of nanoparticles with biomolecules and caveats related to protein denaturation are also pointed out. A clear understanding of nanoparticle-protein interactions could make possible the design of precise and versatile hybrid nanosystems. This could further allow control of their pharmacokinetics as well as activity, and safety.